Polishing wheels are an important part of maintaining any metal, which is why they’re used in various industries. They are often used as part of precision manufacturing services, ensuring the final metal goods are of the desired quality. What Is A Polishing Wheel? As the name suggests, these devices are wheels designed to polish metals. More specifically, polishing wheels are similar to buffing wheels, but use a more abrasive material. This equipment is used on a wide variety of metal, including iron, steel, silver and gold, as well as soft metals, such as copper, brass and aluminum. The purpose of a polishing wheel is to give metal a soft, smooth surface. Metal can get damaged over time, creating a jagged, rough texture. The abrasive properties of a wheel help to buff this down so it becomes smoother. This is achieved by using the wheel in combination with an abrasive compound. This material, combined with the brush-like textures on the wheel, help to restore the metal. Different metals have different needs, however, so you often need different wheels (powered at different speeds) and compounds to achieve the best results. Why Do You Need To Polish Metal? 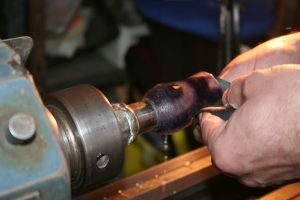 Most industries that use metal will often require the use of a polishing wheel. Some of the larger examples include engineering and manufacturing, where the smooth outer surface is vital. However, metal can often be polished for aesthetic purposes, including the likes of jewelry making and metal craftsmanship. Wheels can be used to restore both old or new metals. Naturally, this will require different treatments. A lighter brush can remove swirling or lighter imperfections from a metal surface, while thicker, more coarse wheels – alongside dedicated compounds – can soften older metals with a more varied texture. Using wheels on older metals can restore older parts or equipment, saving the need to purchase brand new replacements as regularly. Similarly, polishing wheels can also be used on materials that have been coated in metal – typically nickel or chrome plating – to restore the quality of the metal. Again, a lighter brush is often best here, since the coating is typically thinner than that of a purely metal item. As already mentioned, different types of wheels will result in different effects. Many wheels use sisal, for instance, which is a very tough fibre, stranded together similar to rope. Being a tough fibre, it is able to brush away rough metal, stroking down the material. A powerful wheel can quickly remove the rough external texture of metal, leaving a smoother finish. Other materials, such as spiral sewn cotton or canton flannel, have other uses. Cotton can be used to powerfully push through the metal, while flannel can be used for a softer approach. The latter is useful for gold plating and other thin materials, where its lighter touch offers a protective factor. Knowing which wheels to use with which materials is vital for ensuring a high quality finish that doesn’t damage the metal itself. However, it’s still worth remembering that the motor you use to rotate the wheel, as well as the compound used, will also impact the final, end results. For more information on our polishing wheels and services, contact us.